This follows my step-by-step tutorial on how to apply stripes on a boat. 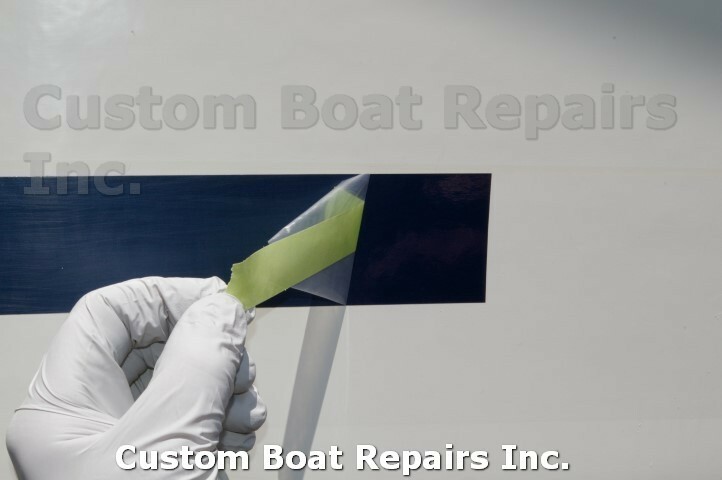 This next procedure gets overlooked 80 percent of the time by boat manufactures and boat owners. It sometimes even fakes me out when this clear liner is on the stripe. I've seen this clear liner on stripes sizes from 3/8" inch to 4" in width -- thats all I work with. But it can also be on other sizes. 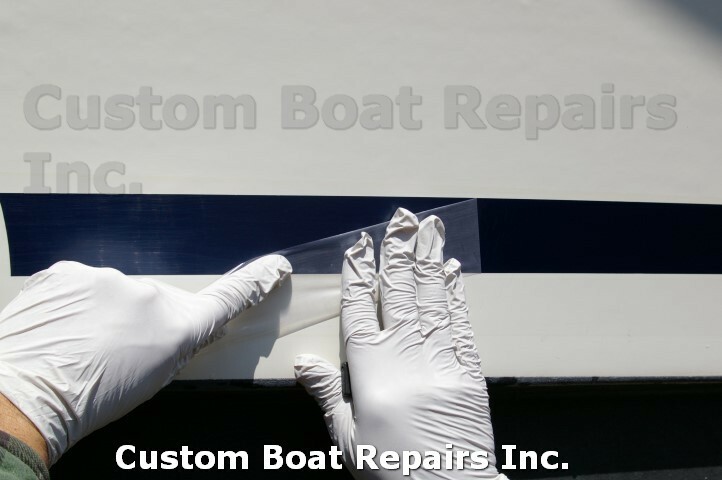 Most of the time, the companies that make boat striping tape apply a clear liner on the tape. This clear liner is to protect the striping tape during the squeegee process, when removing air pockets, while you're applying it. If this clear liner is not on the tape, you can possibly wrinkle and scratch it, while removing the air pockets behind the tape. In the first two photos, you can see what the clear liner looks like after a year in the sun. It starts to peel and it looks bad. When you see this happen, it's too late to remove the clear liner. You just have to remove the whole stripe and start over. When you purchase the stripe, make sure its fresh. In other words, if you see a box of striping tape on a store shelf that has dust on it, pass it by. Striping tape gets old after a year or two, making it very difficult to remove the clear liner. Trust me, it happened to me. Some bigger name companies that supply stripes are: Avery, Spar-Cal, 3M, Prostripe. I have used these companies' stripes and not had any problems with them. 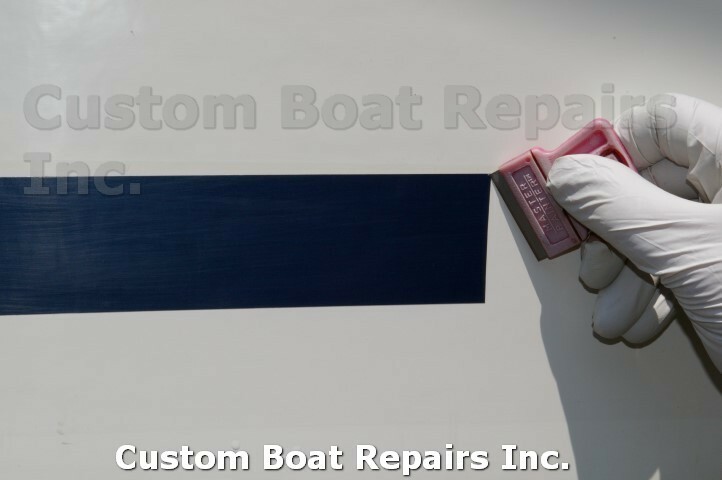 I recall doing a stripe on a customer's boat, while he watched me apply it. 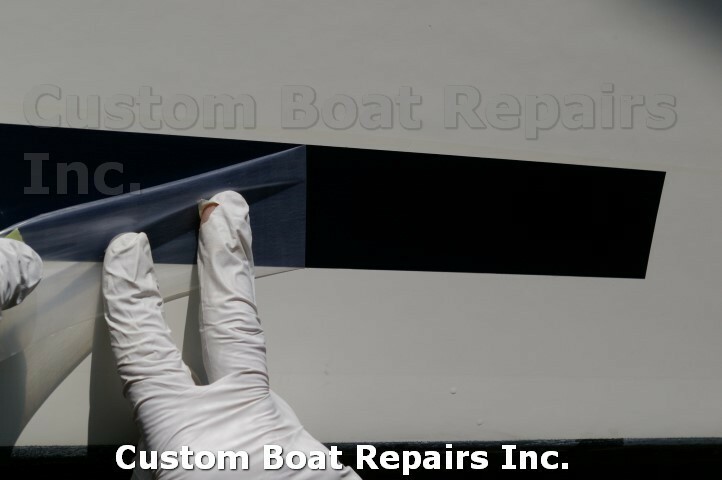 When I finished striping the boat, I told him that I'd have to remove the clear liner next. The customer said, "There's no clear covering on the tape," as he was feeling it and scraping at it. Then he watched me pick at the corner to lift the clear liner. He said, "You're crazy. There's nothing there." After about 5 minutes of picking at it, and using tape to lift the corner, I got it. He was shocked when he saw the clear plastic coating come off. For a minute, I was thinking that the tape didn't have a clear liner either! Just goes to show you how tough it is to see and remove the clear liner. Here, you can see how the clear liner is deteriorating and flaking off. Slits in clear liner. I see this most of the time. Here, I'm picking at the corner edge to start the lift. TIP: Cut the stripe longer than you need, so when you pick the corner, you won't destroy the good section of the tape. Then cut off the excess tape. 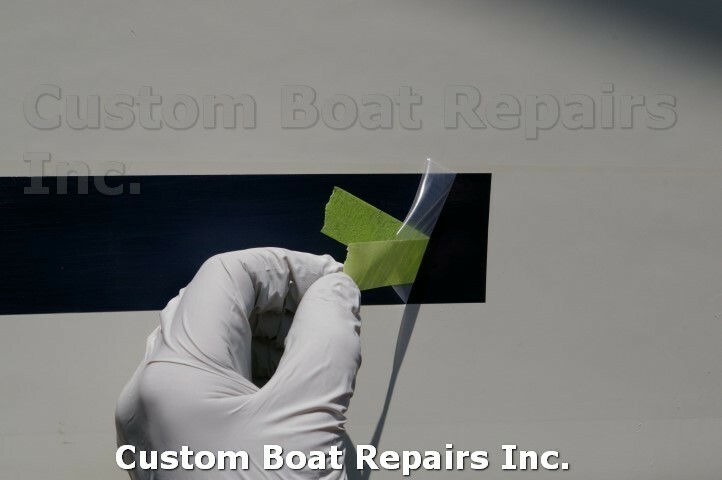 First, you can try putting masking tape on the corner edge of the stripe and start lifting it carefully, to see if the clear liner sticks to the tape (this will only work on fresh tape). If the liner doesn't stick to the tape, then try to lift the corner edge of the clear liner with a razor. If that works, then stick the tape to the razor once it starts to lift, and pull off easily. Here you can see the clear plastic liner. Be careful while pulling it off. 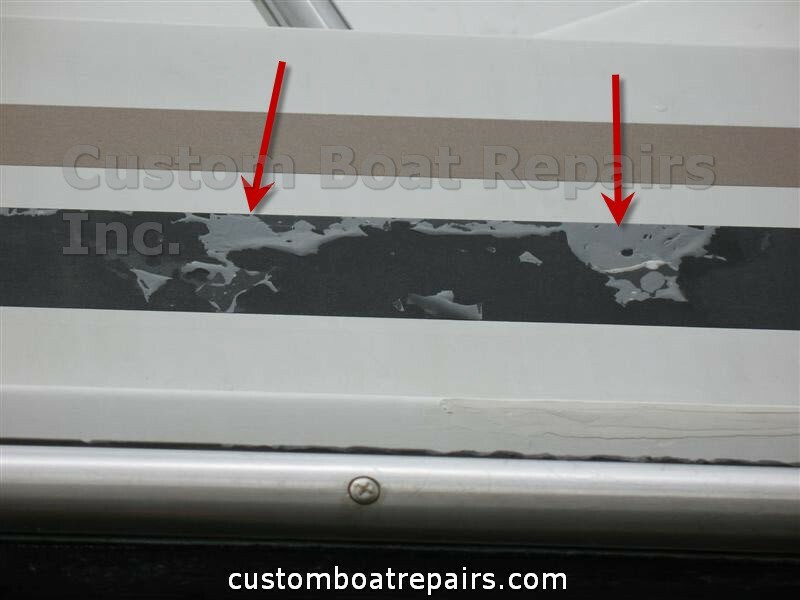 If you just applied the stripe and pull too hard, you will pull the stripe right off of the boat. Do not pull the clear liner 90 degrees to the surface, or you'll create air bubbles. 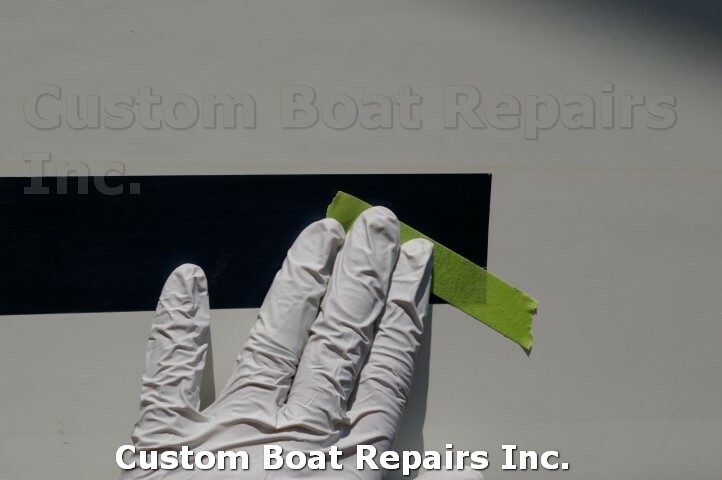 Hold the clear liner directly on the surface of the boat, and pull easily, toward the direction you need to go to finish removing it. Here, you can see the liner coming off really well. 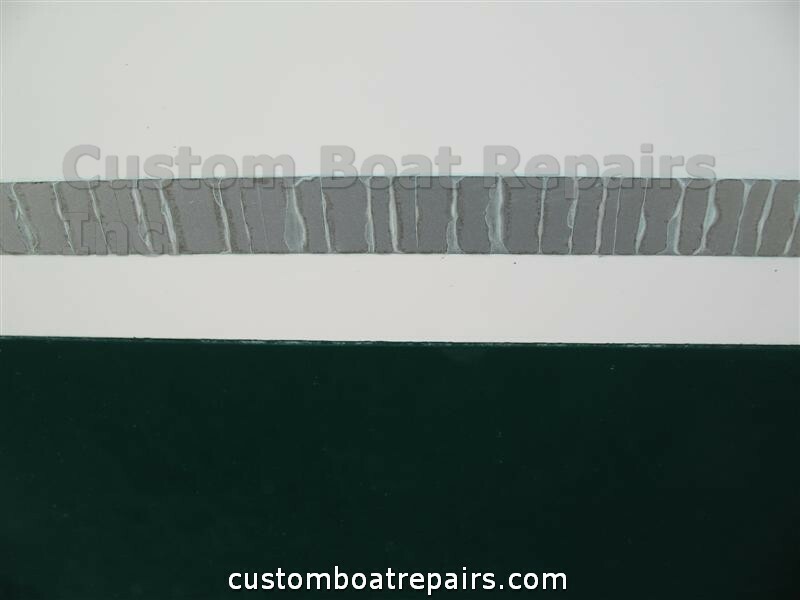 Now, if you left extra tape on the boat to remove the liner like I recommed in photo #3, you can get a straight edge (a 4" metal scraper also works well), and lay it on the stripe at the angle that looks best. Then get a razor and cut it lightly. Be careful, because you don't want to cut into the gel coat.